Zelle: A Bumpy Ride Toward Ubiquity? According to American Banker, the bank-led person-to-person payment network Zelle is making progress, but having growing pains. Banks and consumers have learned a handful of truths — good and bad — about the network as it copes with a number of challenges including fraud threats, growing demand, as well as technical and enrollment issues. Here is what some of the bankers involved have to say about it all. Fraud is an issue, but not an enormous one. News reports in recent months have focused on fraud aimed at Zelle users and raised questions about whether banks are doing enough to protect them. Zelle transactions are larger than you’d think. In 2017, FirstBank handled 1 million Zelle transactions that totaled $338 million, making the average transaction $338. The article points out very interesting uses. The business case for P-to-P is: You have to do it. 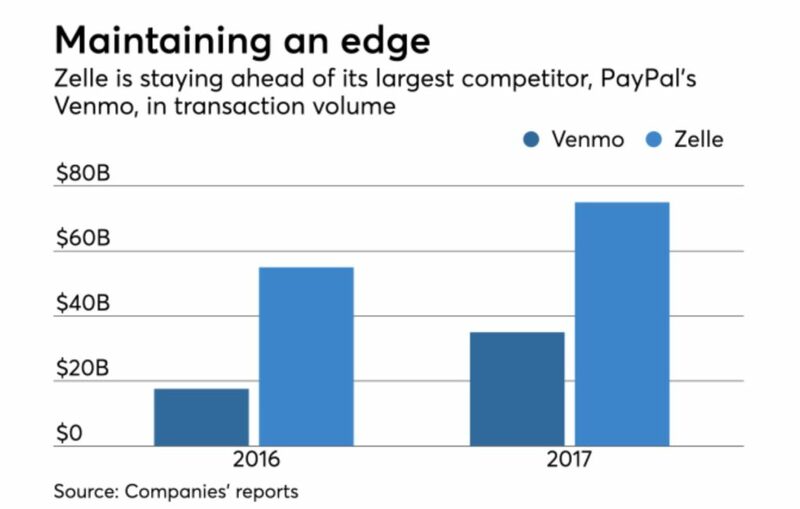 Reuter pointed out that Venmo handles $35 billion in payments a year. And it’s impressive…see image for comparison. Zelle is faster than Venmo. This is well known and the reason for the name Zelle, which is short for gazelle. Zelle payments are push credits, like wire transfers. They go into a bank account, and the money can be used immediately through a debit card, a check or getting cash at an ATM or branch. The Zelle network rules require call for immediate memo debiting and memo crediting of transactions. Deploying Zelle has its complications. FirstBank had a relatively easy time implementing Zelle because it does most of its information technology in house. It built its own core system and mobile and online apps, so there was no need to wait for a vendor to help. Other large banks have many systems to integrate. There can be challenges in the enrollment process. Customers use an email address or cell number as their token, and they can only use one of those with one bank. The story goes on to note that banks adopting Zelle are having to optimize their fraud and security measures above and beyond that of their check processing security. “I know of one bank that was experiencing a 90% fraud rate on Zelle transactions, which is insane,” a PwC partner, Genevieve Gimbert, told The New York Times in a recent story. While that claim turned out to be greatly inflated, fraud does indeed occur. We will not judge the performance choice (haven’t been following Justin Timberlake), but we will underline the fact that new payment platforms, trendy or not, still have a break-in period.